Walker Percy wrote that “bourbon does for me what the piece of cake did for Proust.” Distillers have been appealing to this feeling—something visceral and personal that transcends price points or mash bills—for years. It connects to the collective cultural consciousness: the myths of tax rebels sticking it to Alexander Hamilton; or outlaws at their stills, deep in the hollers of Kentucky; or Junior Johnson outrunning the law on the back roads of North Carolina, packing illegal hooch in the trunk. It is the stuff of cowboy saloons and city dive bars and a thousand country songs. This narrative, of course, is told in the codes of (largely white) masculinity—and aimed at and perpetuated by the kinds of drinkers, mostly men, I suspect, who hope that their poison of choice tells a story about them, and who are worried that it might not be the right one. Bourbon seems like a sturdy marker of a freedom-loving American identity, but that narrative is mostly a pleasant fiction. The truth of the tale lies in mergers and holding companies and transnational distribution rights. George Jones never sang about any of that. The real story of the modern whiskey industry is less romantic but no less American. The country’s “native spirit,” as bourbon is often called, is one of capitalization and consolidation. Hashima, commonly known as battleship island, served as a model for a set piece in Skyfall, the recent James Bond movie. Remember the creepy ruins where Javier Bardem’s character is introduced? That was based on Hashima. Google recently mapped the real island, using their trekker backpack camera. PRI’s The World recorded and wrote a short piece on Hashima after the release of Skyfall. I’ve got a long obsession with (1) tree houses and (2) Japan. This short story and related photographs takes those two interests and smashes them together with vigor. takashi kobayashi is a self-taught designer that has brought treehouse vernacular to the japanese landscape. the carpenter and architect of 120 houses throughout japan, his prolificness is borne of a deep-seated investment in the creation of a new architectural tradition in his country added to the hefty, overall aim of each project- to erode the boundary between man and nature. using reclaimed wood, the designer and his collective treehouse people have developed methods since the first building in 1993 for the arboreal structures balanced on living boughs and limbs that avoid stunting the growth of the tree. Back in 2008, the Tokyo Metro system launched a three-year-long campaign aimed at reminding subway passengers to mind their manners while riding the trains. It featured the slogan “Please do it at home” or “Please do it again” alongside an illustration of the featured manner or rule. All posters are written in Japanese and English, some featuring hilariously outrageous and sometimes confusing activities that make you wonder, “Do people actually do that on a train?!”. In a few days, Japan will mark the 2nd anniversary of the devastating Tohoku earthquake and resulting tsunami. The disaster killed nearly 19,000 across Japan, leveling entire coastal villages. Now, nearly all the rubble has been removed, or stacked neatly, but reconstruction on higher ground is lagging, as government red tape has slowed recovery efforts. Locals living in temporary housing are frustrated, and still haunted by the horrific event, some displaying signs of post-traumatic stress disorder. Follows up on a similar activity they did after one year. In fact, some of the before shots are the same — so you can see how things looked a year and two years after the devastating disaster. Really cool - and thoughtful - use of internet tech from Google. The before and after photos, in particular, are striking and overwhelming. I like this kind of thing — it imagines the internet and social networks out of the doldrums of daily life and highlights the power of these kinds of technologies; it remembers the old promises of what these technologies could do for us. On March 11, 2011 a devastating earthquake and tsunami hit northeastern Japan, causing unimaginable damage. Many people lost their lives, their homes, and all their precious memories collected over generations. Among the things lost were precious photos and videos — cherished images of family, friends, pets and once-in-a-lifetime events — buried in rubble or washed to sea. To help people in Japan share their photographs and videos that did survive, Google created a website, “Mirai e no kioku” (text is in Japanese only), which means “Memories for the Future”. Through this site, people have been able to rediscover lost memories of their homes and towns. Google is now also providing thousands of miles of Street View imagery in the affected areas that were collected before and after the disaster. Seeing the street-level imagery of the affected areas puts the plight of these communities into perspective and ensures that the memories of the disaster remain relevant and tangible for future generations. Click the “Before” or “After” links at the top of this page and use the Google Maps display to see the areas where we have Street View coverage. Find an image in Street View by dragging the yellow “Pegman” icon onto the map where you see a blue overlay. Then click between the “Before” and “After” links to see how the earthquake and tsunami impacted that area. Japanese photographer Yu Yamauchi spent five months a year for four consecutive years living on a hut near the summit of Mount Fuji. Every morning, he shot sunrise at the exact same location. The photographs are astonishing. A few more of my favorites are below. 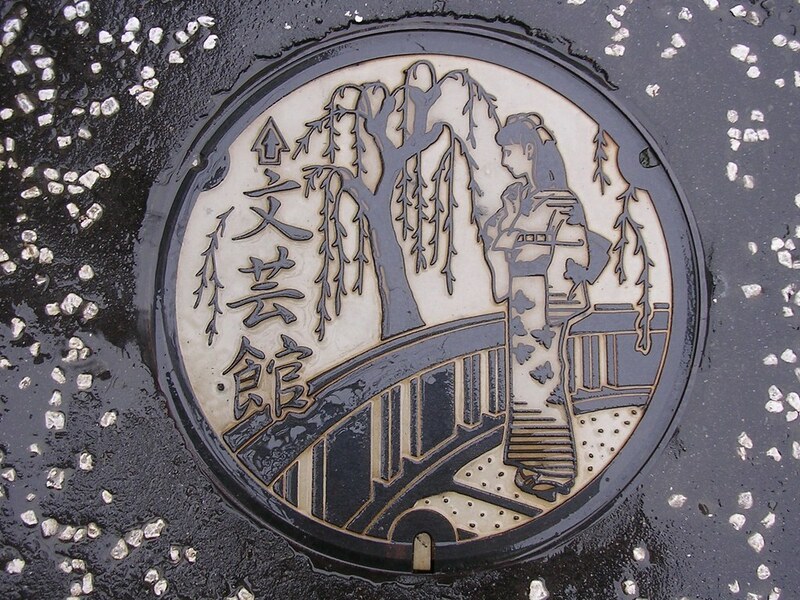 Flickr’s blog recently featured a set of Japanese manhole covers from MRSY’s photostream. There’s also a pretty expansive group featuring similar shots. In the 1980s cities began making customized manhole covers. Today nearly 95 percent of the 1,780 municipalities in Japan sport their own specially designed manhole covers. Designs range from images that evoke a region’s cultural identity, from flora and fauna, to landmarks and local festivals, to fanciful images dreamed up by school children. It is the fundamental issue of our time: Energy; where we get it; how we use it; what happens then. It powers our homes and our economy; it creates troubled alliances and disturbing divisions; it empowers and impoverishes; it enables almost all that we do and now threatens all that we have become. The Peabody-award winning SoundVision Productions presents BURN: An Energy Journal, a broadcast and digital project hosted by one of public radio's most trusted journalists and master storytellers, Alex Chadwick. Alex will explore our energy future through the intimate stories of visionaries of research, maverick inventors, industry insiders and concerned citizens. These personal stories will help explain how and why we face an energy crisis, the dilemma of the continuing demand for energy, the realities and consequences of a mostly carbon-based industry and infrastructure, and some possible alternatives and personal/global solutions to an energy and climate future in the coming decades. BURN will follow the quest for Energy answers and the stirring public initiative required to transition to this new energy world. I'm listening to the first episode now about the Fukushima Daiichi disaster and what it means for nuclear power in the future. Really well put together and reported. And timely. Highly recommended. Listen here. There are two sayings in Japan for when bad things happen: shikata ga nai, an idiom that means "it can't be helped"; and gambaru, a verb translated as "to persevere against adversity." When life doesn't go your way -- a job loss, illness or a romantic failure -- your friend is likely to say, "Sho ga nai" (a variation of shikata ga nai), it's out of your control. If you need a boost before an exam or when your favorite team is losing, you hear "gambatte," you can do it. Several survivors shown here, their faces carved deeply like woodblocks, withstood wars, rationing, atomic bombs, postwar reconstructions, economic booms and busts and now an earthquake, tsunami and nuclear meltdown. From the outside, it looks as if the Japanese accept all things with equanimity. But we cannot know if inside, the survivors want to spit at another well-intended sho ga nai. See the associated slideshow, Faces of the Tsunami. TOKYO (AP) -- Last Sunday was the six-month anniversary of the day the massive earthquake and tsunami devastated Japan's northeast coast. Last week the Kyodo News agency distributed an amazing group of combination photographs showing three scenes. The first scene is right after the earthquake and tsunami hit, then three months later and finally, how the scene looks now. Amazing article from a leading energy thinker. A portion is quoted below; I recommend reading the whole thing. I can find no escape from Fukushima Daiichi. Words I hoped never to read in a news report, like loss of coolant accident (LOCA), exposed core, hydrogen explosion: Here they are. Except for those who can identify ways to contribute directly to the management of the disaster, we scientists have only one job right now -- to help governments, journalists, students, and the man and woman on the street understand in what strange ways we have changed their world. We must explain, over and over, the concept of "afterheat," the fire that you can't put out, the generation of heat from fission fragments now and weeks from now and months from now, heat that must be removed. Journalists are having such a hard time communicating this concept because it is so unfamiliar to them and nearly everyone they are writing for. Every layman feels that every fire can be put out. We must also explain the strange temporal features of radioactive spent fuel. Hour by hour, week by week, year by year, one isotope passes grief to a second and the second passes grief to a third. As the tragedy emerges at Fukushima, the moral complexity is overwhelming. The radiation is coming primarily from short-lived isotopes, and it is lethal in hours for anyone who is near the plant. We are watching a civilized society facing Sophie's Choice writ large, as the Japanese government decides how to use workers and soldiers and volunteers at the site, trading their large doses of radiation against an outcome where far more people will face the statistical risks of a shortened life. Evacuation is another part of the agony. So, too, is distribution of iodide tablets to limit thyroid cancer. Already, however, the next form of grief is emerging: grief that results from ambiguity. Small quantities of radioactivity are being detected in food. Unless a large dread-to-risk ratio is assigned to choices such as whether to eat or not to eat, the experts' models of risk will not match the choices. Inevitably, much more of the same lies ahead, with immense human costs, as measurements on fields and city streets and in buildings confirm contamination with radioactivity. Notably, two rogue isotopes with 30-year half-lives, Cesium 137 and Strontium 90, will be found everywhere, both of them unmistakably attributable to the accident. They will be measurable throughout the lifetimes of everyone alive today. Throughout this century, the poor will live on the contaminated land, eat the contaminated food, and live in the contaminated buildings. All aspects of the suffering that has come -- and will continue to come -- from the succession of dominating isotopes are familiar to philosophers and economists, to the nuclear power community and its civil defense counterparts. This video is a little strange -- but also telling about the cultural differences in disaster perception (and to an extent, risk communication). I haven't decided if the take in the film is good or bad or propoganda. The majority of the government and corporate communication about the reactors has been less than ideal. But the response among the people -- away from the kludgy, monolithic bureaucracy -- has been graceful and stunning. Its hard to imagine the difficult feat of stillness after such a far-reaching tragedy, yet we witness solidarity, calmness, and quiet amongst the cacophony of tragedy after tragedy after tragedy. And then there are the faceless, fearless fifty [or however many may actually be working at the plant] heroically, tirelessly, without individual acknowledgement or recognition, but with the promise of future danger, malaise, disease... not to be forgotten. Our response in America seemed the opposite. We're re-learning what it means, as a population, to have a graceful, eloquent government -- and Obama lived up to our new external face. Meanwhile, our population at large exhibited a mixture of some empathy and overwhelming self-concern. The radiation is coming. Where can we get potassium iodide? The tsunami will obliterate the West Coast. And oh yeah... how're the Japanese? Kristof has a great editorial about "Learning from the Japanese." Read it here.